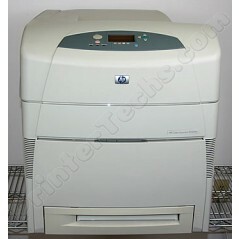 The HP Color LaserJet 5550 series is a heavy duty color laserjet printer capable of printing 11x17 pages. A refurbished 5550DN (pictured on the left), includes a JetDirect card for connecting to a network, a built-in duplexer for two-sided printing, and a 500-sheet paper cassette. These are excellent printers for medium to high volume color printing. They are workhorses in offices all over the world. Compared to HP's latest line of color LaserJets, a refurbished 5550dn can save you a bundle in printing costs! Also, compare our toner cost with HP's pricing -- you'll be surprised at the savings!! Please Note: most of our customers do not require toner cartridges, cables, manuals, or drivers. Therefore our printers are priced and packaged without these items. A power cord is included. If you need toner cartridges or cables please add them to your shopping cart. Users manuals and drivers may be downloaded at www.hp.com.